Cyclists in the City: Jeremy Clarkson admits he loves Copenhagen-style cycling and implicitly rejects Boris Johnson's cycling strategy, as fourth transport organisation slams Mayor's transport policies. Why are London's Conservatives so out of touch on cycling as a normal, safe, everyday mode of transport? Jeremy Clarkson admits he loves Copenhagen-style cycling and implicitly rejects Boris Johnson's cycling strategy, as fourth transport organisation slams Mayor's transport policies. Why are London's Conservatives so out of touch on cycling as a normal, safe, everyday mode of transport? I mentioned last week how the Chair of the Transport Planning Society - traffic forecasters - had declared that the plans on which Boris Johnson is relying (more traffic, more congestion, more cars) are 'no longer realistic'. The previous week, Sustrans, the national cycling charity also slammed Boris Johnson's manifesto saying there was "not a single commitment to additional funding for cycling or walking. It seems that Boris is intent on bringing the capital to a standstill." The London Cycling Campaign issued its own line-by-line analysis of the cycling plans of the four main candidates. The Campaign concludes rather damningly that: "None of the candidates’ manifestos makes concrete commitments in terms of funding for cycling provision, nor do they set targets for increasing the proportion of journeys by bike." The London Cycling Campaign ranks each of the Mayoral candidates' policies. The scorecard gives much more strongly delineated results than I'd have expected. Jenny Jones (Green) comes first, followed by Ken Livingstone. Boris Johnson and Brian Paddick both fail dismally. Johnson is singled out in particular and scores 0/10 on some cycling issues. I'm slightly surprised by the low score for Paddick. Although I think Paddick himself is a rather new 'convert' to the cycling message, he has at least been out on Blackfriars Bridge protesting for better facilities (seen here on a Boris bike), and his transport spokesperson Caroline Pidgeon, has been consistently supportive of cycling measures. Pidgeon is one politician who I think does genuinely understand the issues. Over the weekend, another transport organisation issued its verdict. Boris Johnson's transport policies, says the Campaign for Better Transport, 'mark a return to 1960s' transport planning'. The report states that the Mayor's policy has "helped speed up car journeys at the expense of the safety and convenience of cyclists and pedestrians". This is the same thing that several London politicians have been saying all year. What I find interesting in all of this is that Boris Johnson is someone who has made a lot of noise about cycling. The fact that he has recently secured money to make junctions safer for cycling is very positive news indeed. Yet, it's not really a cycling strategy, it's just a one-off project. What's even more interesting is that the Mayor seems to be increasingly out of step on the issue of cycling. I'm not going to take this as evidence of a wholescale change of heart but I was stunned by a piece written by Jeremy Clarkson in this weekend's Sunday Times. Cycling in Copenhagen, says Clarkson is "fan-bleeding-tastic. And best of all: there are no bloody cars cluttering the place up. Almost everyone goes almost everywhere on a bicycle." You can read more about the article on road.cc's website here which has most of the text or in a summary (free) on The Times's website here. Even more tellingly, Clarkson points out that in Copenhagen cars and bikes do not share road space. Sharing road space, he says, "cannot and does not work". In making this statement, Clarkson is just the latest in a string of high profile figures to completely reject Boris Johnson's mantra that people should just hurtle themselves through massive road gyratories on their bikes. Earlier this year, Olympic road cyclist Nicole Cooke slammed the Mayor (implicitly) for saying that people should just 'keep their wits about them' and pedal furiously through junctions like Elephant & Castle roundabout. Now Clarkson is suggesting similar. I've never understood why London's Conservatives don't 'get' cycling. If you look at last week's Mayoral transport hustings, what seems to be happening is that Labour, LibDem and Greens are all converging on policies that are about giving more choice to Londoners to walk or cycle. Often, that means giving people the chance to cycle where the roads are made calmer and less intimidating. Sometimes that means separate flows for motor vehicles and for people on bikes. Sometimes that means quieter, traffic-calmed routes. Either way, there seems to be growing consensus that things need to change on London's roads. Unless you're in the Conservative party. The Conservative line (represented at the hustings by Richard Tracey) seems to be 'cyclists ride on pavements'. And that seems to be the end of the debate. It's a view that completely and utterly misses the point. Imagine a political party that refused to take car driving seriously because some drivers speed or use mobile phones when they're driving. The thing is, if Jeremy Clarkson can 'get' cycling, then Boris Johnson's party ought to 'get' cycling as well. But so far, they're completely and utterly failing to do so. The Mayor's road transport policy has alienated Sustrans, the national cycling charity; it has the thumbs-down from the London Cycling Campaign; the Campaign for Better Transport has dismissed the Mayor's policies as 'unsuccessful' for motorists as well as being anti-cycling and the Transport Planning Society (not a particularly political body, as far as I can tell) doesn't seem to think much of Boris Johnson's plans either. It's going to very interesting to hear how the candidates handle this topic in a few weeks' time when they're grilled by the editor of The Times, just before the election. My own view? I'm not all that impressed by Ken's cycling credentials but agree with the London Cycling Campaign on their relative merits. I'm certainly not impressed by Boris's plan to turn London into a place full of road building and fast cars. 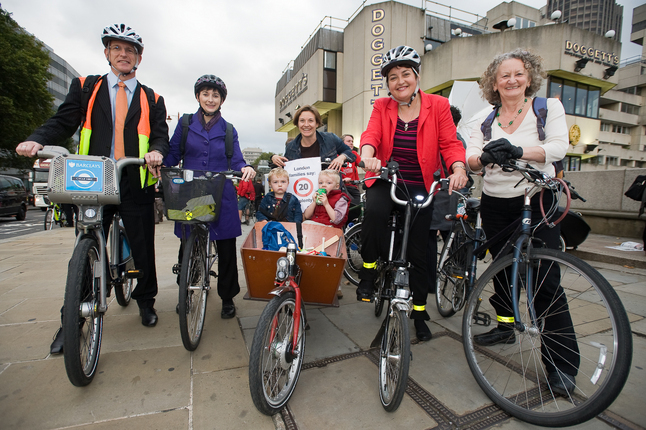 I'm looking for the candidate who will deliver what's best for Londoners who want to use their bikes safely. "I'm looking for the candidate who will deliver what's best for Londoners who want to use their bikes safely"
So I'm signing up to vote with my bike on 3rd May 2010"
Looking at their website, (http://www.londonersonbikes.org.uk/) they say that "Three out of four election candidates have been in touch asking what we Londoners on Bikes want from them, and we’ve contacted the fourth to see what he has to offer." Consider signing up to let the candidates know that we are serious when we say that bike safety has to be an bigger issue in these elections. However, if even petrol-heads like Clarkson can recognise the benefits of cycling, then there's light at the end of the tunnel, even if the light at the end of the tunnel is is coming from a hoard of homicidal maniacs high on an admixture of testosterone and gasoline and driving 4x4s belching noxious fumes. Vote for a liveable London and that certainly does not include Boris. As to the best choice, we need to see, but Boris has already shown us what we can expect from him. I e-mailed Paddick about his manifesto, John Priestly got back in touch with me saying the LCC's analysis was unfair and they were publishing their full cycling manifesto this week. I pointed out the cobbling something together last minute was another sign of their commitment but let's wait and see. I can only assumer Paddick will publish a very pro cycling piece of thinking, sadly way too late to help him. Firstly, the specimen you refer to has produced streams of violent, incendiary material over the years which anybody concerned with the actual and potential victims of rule and law breaking motoring should utterly repudiate. I think it important NOT to take him seriously. Secondly, if you do have to refer to his views, I'm afraid you are rather naive in thinking that he has now come over to the side of cycling. OF COURSE he likes segregation - that means that cyclists are not "in his way". The "cyclists/pedestrians don't mix with motor traffic" (generally refrred to just as "traffic" because people outside motor vehicles don't count as anything) trope has always been used by car freaks. A lot of people pushing for segregation of cyclists don't seem to understand that.. If this character is going to be listened to, it is as an argument AGAINST segregation. On the subject of Jeremy Clarkson, I suspect that the views he expresses are largely about creating a persona for himself as a TV personality. It is his living after all. As to whether he is secretly pro-cycling, I have no idea, but his approval of separation could perhaps be not just that it gets us cyclists out of the way of drivers on the road. I would like to hear more from him on this before I drew a conclusion. On the subject of the recent Living Streets hustings, I challenged Richard Tracey on his reported comments, pointing out to him that measured statistics over time strongly indiocated that cyclists are a mere pimple om the backside of the real source of road danger for pedestrians – the unrestrained motor vehicle - and this is the response I got. “What I said is that a large number of the email and personal complaints I receive from the public is about cyclists riding fast on pavements. Partially immobile people, elderly, poorly sighted, and young mothers with children or buggies are regular complainants. They ask me to request the police take more action. I can’t say whether this is the unvarnished truth, or whether Mr Tracey has been highly selective in his recall of or reference to the views expressed by his constituents. I would like to believe that he has not been selective, rather the majority of calls or emails he gets on road issues are indeed like this. What it tells me is either that the complainers are a vocal minority, who make a lot more noise than their significance, or probably more likely, that cyclists, and pedestrians with a beef about internal-combustion-engine danger they face on the roads, and nowhere near vocal enough. If this is because they feel that Tracey will just ignore them because he prefers to hear only what tickles his own prejudices (and I dare say that is at least a factor) then I would suggest that they should get a lot more stroppy with him, let him know more loudly and more often what they think. I can’t believe that there really are more, in absolute or relative terms, pedestrians complaining about cyclists than there would be people complaining about car-induced road danger if the latter were to speak out. Paul M, a good post. However, one point you miss out is that we have been conditioned to accept road danger. that si to say that throughout society danger from motor vehicles is seen as natural and inevitable: kids are schooled into getting out of its way from an early age and the motorised are taught that they have a basic right to do what they want. In that kind of society, there won't be as many voices as you (and I) thinki are right to protest about motor danger, because it has been accepted. Along , of course, with the part of that culture which teaches us that when motorists break the law they get cuaght - which of coyurse is hiughly unlikely. Where is all this furious pavement cycling going on then? Just in the mind of the Daily Mail reader I guess. I have never experienced or seen a cyclist on pedestrian conflict on a pavement. Off the pavement, yes, especialy where Oblivia wanders into the road with her head in ipod lala land. Most pavements, as measured by distance and time, are wholly free of pedestrians. But the Regents Canal towpath is evidence that cyclists can mix with pedestrians without fatalities. And with joggers and toddlers and dogs and prams and barbeques and anglers... So what's the big deal?